By the age of 14, Brittany Harris had already raised more than $100,000 for water wells by baking cakes and pies. In the Summer of 2016, she got to with Water Wells for Africa to go visit some of the wells that she has funded. In 2015, her story made national news. View the original article from ABC13. A teenage girl is making a big difference on the other side of the world through baked goods and the support of her community. “I was really moved, and heard a calling from God to do something about it,” said Brittany Harris. Harris was only nine years old when she said a video at church struck a chord with her. The video showed children and adults in Africa who did not have clean water and were in dire need of a clean water source. “I just knew that I wanted to help these people in anyway that I could,” said Harris. Brittany said she went to her parents and told them she wanted to raise money to help build a water well for a village in Africa. Brittany did what she knew how at the age of 9, she began baking up a storm. She sold Thanksgiving pies and cake balls to her friends and neighbors. “I was just a girl who had a dream, and I did not know where it was going to take me,” said Brittany. That first year, she raised enough money to build a water well. But she wouldn’t stop there. Now in her fifth year, she’s raised more than $100,000 and has built nearly 20 water wells. 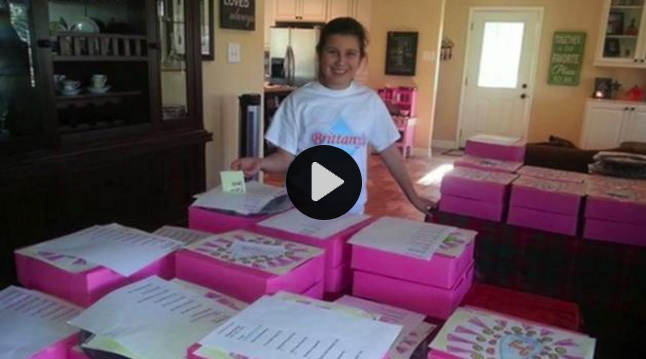 The Brittany’s Dream Project has become a community-wide effort. “When she bakes, we will have a house full of teenagers and other volunteers who come just because they want to be a part of it,” said Mandy. Months ago, Brittany was sent a video from Africa by the group Water Wells For Africa. The video showed a well that was installed using Brittany’s donations. “We just cried when we watched the video,” said Harris. Brittany is now 14 and proving you’re never too young to make a big difference on the other side of the world.